Daily actions documentation prepared for managing records of every action conducted for troubleshooting in production lines. Daily action documentation established, maintained and update to managing all activities are conducted for troubleshooting in various departments, various machinery and equipment are complied requirements of maintenance, solutions are recorded of production lines. Daily actions records are maintained for analysis information collecting which are done during month, all the information are managed for identification of root cause and sources of cause to eliminate problems in production lines, identified problems during the month at same places or same machinery or same kind of problems that occurred during month are conducted and identification of solution to prevent reoccurrence in production line. Daily actions documentations are records for the daily actions are conducted at various locations that each actions are conducted as per troubleshooting and solutions identified during the month. 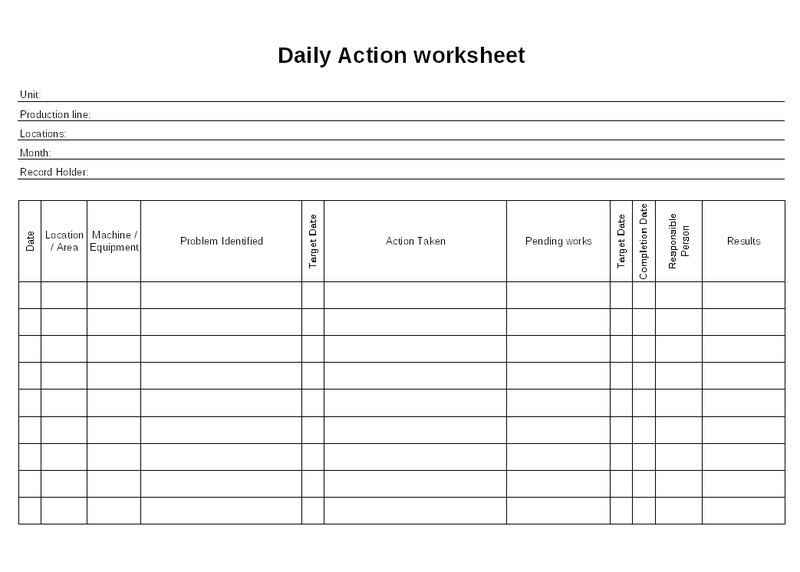 Daily action worksheet format covered entire manufacturing unit’s information concern actions are taken for troubleshooting, identification of problems and completions. The information is also used for the analysis to identify source of causes that helps to determine action to eliminate problem raised in various department and locations to improvement of system and productivity. Daily actions worksheet is also record information of pending works that not conducted at or pending to identification of proper solutions that supporting to manage priority for conducting works at production lines.